Editor's note: The Tour de Lyme is unusual in having five road routes and three mountain bike courses. 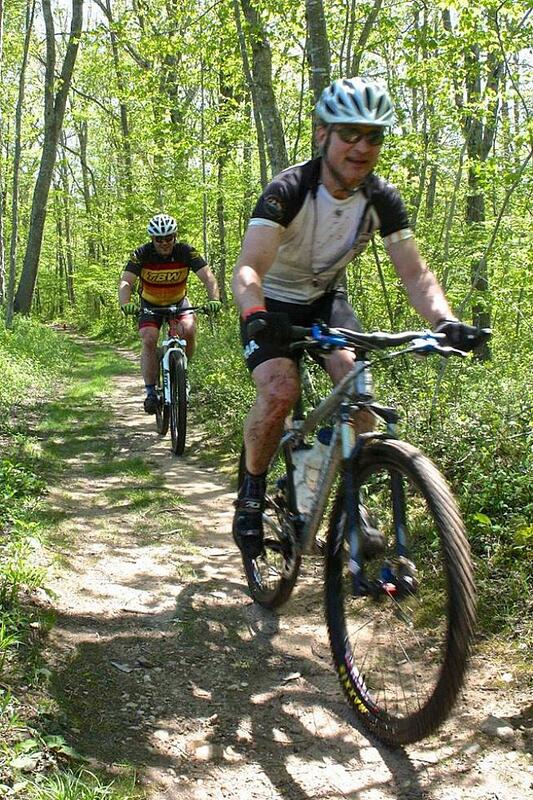 Matt Griswold reports on his ride with big knobbly tires. The Day dawned cool and foggy as all manner of cyclist converged on the bucolic paddocks of Ashlawn Farm in Lyme, CT, for the third annual Tour de Lyme. Eight hundred strong, restless roadies and their hairier cousins, the trailriders, mixed well in the pre-ride murk, pinning numbers, casting glances, and visiting the dreaded blue lagoons. Soon the 57-mile Challenge road crew rolled to their start, and then, those of us for the forest-bound Rider's Test. The 26 plus mile mtb course offered a deep-stash peek at some truly majestic riding through three old-school Lyme parks. A rather casual roll out cast us down through the east pasture and aside good Doctor Semple's backyard onto Blood Street and a hurtling descent to the banks of Rogers Lake. With a snap, up rose Beckett Preserve, with its gut-mashing 300 foot vertical pavée climb straight into a twisty and leaf-strewn descent to the shores of a glisteningly still Uncas Lake. Once across the rocky inlet stream, up reared Nehantic State Park. The troop soon cringed, as this southwestern section of Nehantic proved fraught with the perilous singletrack trickery of Skeleton Ridge. Laced with natural features, the Ridge soon shredded the pack as we navigated tight traverses, kidney punch climbs, rock wall drops, rickety crossings, and a new natural half-pipe worthy of any Disney thrill ride. The horde then styled an ancient sheep pen wall, and forged on across a bumbly streambed, only to be slapped with the steep and sinewy Laurel Canyon Climb. Soon, with the Ridge regained, we swept through the glacial erratic Lunch Rocks perched high on the bluff and guarded by century old red cedar skeletons from pasture's past. Off the Ridge, rolling fire roads and a swampy crosscut lead to the tearing fast "#9" descent, and a meaty climb up Brown's Hill via The Beaver Bender. We then sliced and diced our way down to Dead Man's Lot, and turned northward for a gravel grind to Willauer's cut thru. After a fast slashing slalom, we bottomed out on gravel again and flowed into to Aid #1 and the ten-mile marker. Here, to our utmost delight, a friendly gaggle of volunteers showered us with bunches of bananas and rainbows of Gatorade. After a brief taste of the civ., the crew turned from the sun and headed for the Archer Preserve, and the strength-sapping climb up mighty Mount A. At the crest, we'd made the halfway point, and as reward, we dined on the swoopy delights of a super kind and buffed White Trail loop. Here, high above Hamburg Cove, the trail bucked and heaved through White Pine and Oak glades, while clusters of ferns hay-scented and Viola labradorica nodded their approval as bikes blurred by. Legs stretched and minds blown, we crossed the road just in time to be sucked earthward by a demonic double-track descent to the very bowels of the cabbage-encrusted Eight Mile watershed and back to Aid #2. We fueled up again, and would need it, for the longest climb of the morning reached out his gnarled hand, and beckoned to a serpentine slither up the fecksome flanks of nasty Nickerson Hill. We paused to take in a glimpse of Long Island Sound in the distance, then hurtled self and steed down the rock-and-body-strewn Nick Ridge Rumble. Once past the straights of the Pinball Wizard, we sizzled through more loamy and techy treats studded with piles of pink swamp azalea and fresh wood fern alleys. Finally, the loathsome scarred washboard Climb from the Can reared back and stuck a final fork in our eye. T'was mostly all downhill from here, except where it wasn't, and we were soon home free, 3,000 feet of climbing behind, and the wondrous green glowing glades of Ashlawn ahead. Congrats go to Clint Angwin of WRJ New Hampshire and Brett Severson of Colchester, CT, who blazed the 26 mile course in a record-smashing 2hrs. 36min. And, many thanks to the countless volunteers who made The Day a giant success! 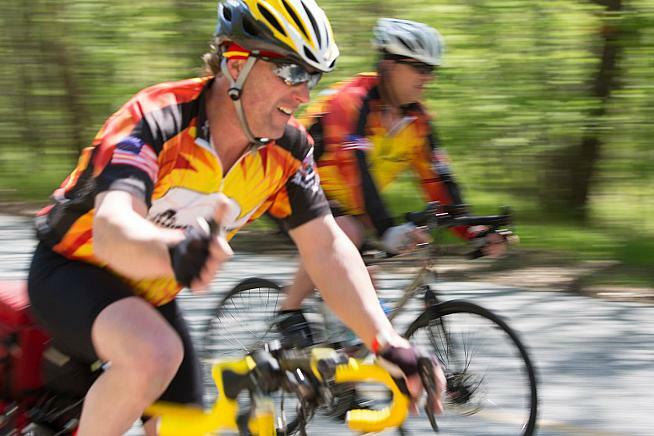 The Lyme Land Conservation Trust of Lyme, CT organizes and holds the annual Tour de Lyme to help raise funds and awareness for open space preservation in Lyme. To date, the Land Trust has protected almost 3,000 acres. The preserves with trails are open to the general public. Matt Griswold is a native Old Lyme'r, with family in the town dating back 12 generations to 1640. 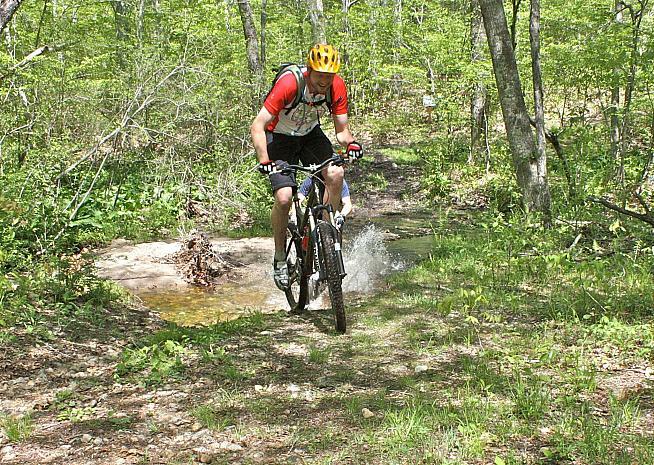 The Tour de Lyme mtb course holds a special place in his heart as he and a group of friends built and maintain many of the trails over which the course winds.